These bottles are perfect for storing sage infused olive oil to flavor sauces, roast chicken and turkey, or just to use for dipping your favorite crusty bread. You can find the bottles I used with a click on the image below! Leaves are changing, fall is in the air and I’m starting to figure out this year’s Thanksgiving menu. Even though it’s over a month away, we’re all hyper-aware it’ll be here before we know it! One idea I plan to try is using sage infused olive oil to baste the turkey instead of just plain olive oil and butter (but, let’s be honest, I still may need to use some butter, because B U T T E R). Infusing oil with flavors is really simple, and the end result can be something you use immediately (garlic infused olive oil for a quick weeknight pasta sauce), or something that you store to use over time. Sage and poultry go together like peanut butter and jelly, so the idea of infusing oil with that flavor and scent seemed like a no-brainer. And, while I do love the scent and taste of sage, I find it can be really overwhelming sometimes. Infusing the oil with sage gives a lighter note, something you smell and taste in the background, rather than the first flavor that grabs your attention. After the olive oil and sage leaves spend some time cooking over low to medium heat in a sauce pan and then cooling, you’ll need to store the sage infused olive oil somewhere. I found these SKS Clear Glass Beverage Bottles w/ White Metal Plastisol Lined Lug Caps are the perfect shape, size and function for storing an average bottle of olive oil (16 oz). 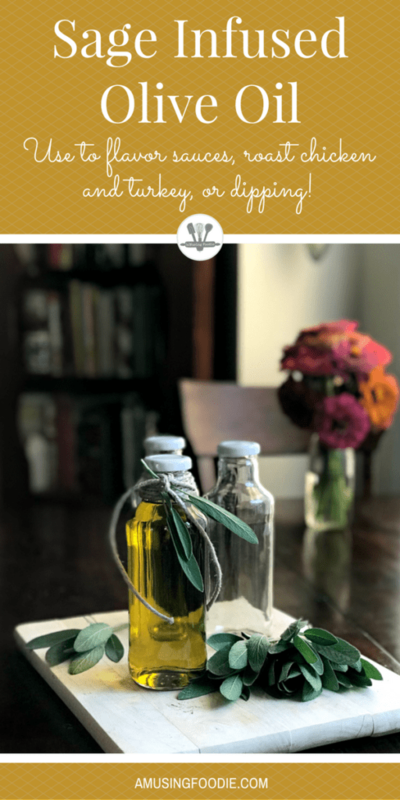 And, while they’re practical enough to use everyday in my own kitchen, they’re also cute dressed up simply with a little twine and a sprig of fresh sage, if you’re looking for a gift to give over the holidays or as a housewarming present. These bottles are perfect for storing sage infused olive oil to flavor sauces, roast chicken and turkey, or just to use for dipping your favorite crusty bread. Add the olive oil and sage leaves to a medium sauce pot. Warm over medium heat until the oil is hot, about 5 minutes. Pour the oil carefully into a wide-mouthed glass jar with a lid, and let it sit, away from direct sunlight, until it's cooled completely. Use a mesh sieve to strain the cooled sage infused olive oil into the tall sauce bottle (consider using a funnel if you're worried about dripping), and then cap. Store in a dark space and keep it at room temperature. And, as someone who really loves being able to buy things online, rather than schlep to stores, I really appreciated how simple the online ordering process was with SKS. Products like these SKS sauce bottles, but also a slew of other great container options, are clearly labeled and easy to navigate.